The preseason has officially come to an end and Week 1 is near. Before we get started on the opening week of 2018 fantasy football action, we’re taking one quick run through all of the divisions with some last-minute fantasy quick hits. We’ll offer up a fantasy value, bust, and sleeper along with some rookies to know and dynasty quick takes for each team. In this edition, we examine the AFC West. 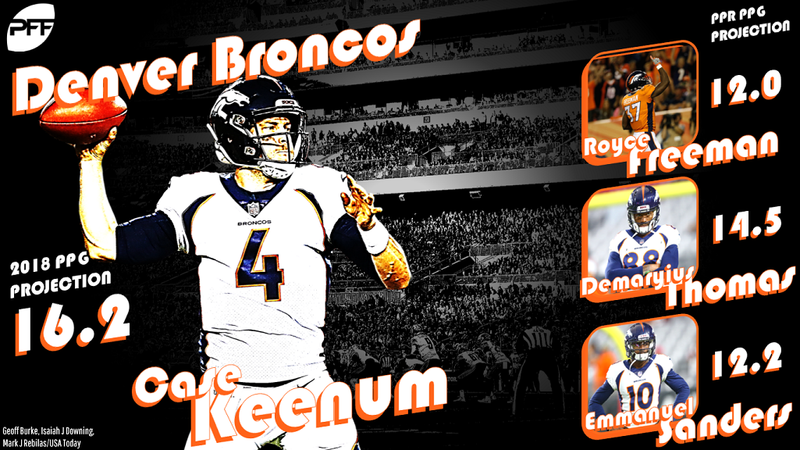 The Broncos attempted to solve their multiple-season quarterback issue by signing Case Keenum this offseason. The journeyman helped the Vikings make a deep playoff run in 2017 and can hopefully reinvigorate fantasy favorites Demaryius Thomas and Emmanuel Sanders – he propped up two top-24 PPR wide receivers in Minnesota last season. Best fantasy value: Emmanuel Sanders, WR — Sanders appeared to have built the strongest rapport with Keenum over the summer, and it showed up in the preseason to the tune of a 4/61/1 line in limited work during the team’s dress rehearsal. Fully healthy following an injury-riddled 2017 campaign, Sanders sported an ADP of WR30 in drafts this year. Prior to 2017 he had finished as a top-20 PPR WR in three consecutive seasons. Fantasy bust: Devontae Booker, RB —Booker has been a disappointment as a runner through his first two seasons and hasn’t been able to create on his own. He will maintain some passing-down utility but returning value at his ADP of RB46 with newcomer Royce Freeman in the fold seems unlikely. Sleeper to watch: Chad Kelly, QB — The second-year passer performed well enough to convince the team to move on from the Paxton Lynch era. If wins don’t come early for this team, it could be tempting for them to give Kelly a look this season. Rookie(s) to know: Royce Freeman, RB, and Courtland Sutton, WR — Freeman was a riser throughout draft season and really shined in the preseason (15/84/3). If he sees a workload similar to C.J. Anderson when he was around, he could prove to be a slight value at his ADP of RB20. Sutton doesn’t figure to make much of a fantasy impact this season behind Thomas and Sanders but could become a dynasty target if his owners grow frustrated about lack of rookie production. Best current player for their 2020 roster: Freeman — The well-rounded talent has the look of an every-down back and could be the key to a transition to a new-look offense in the near future. The Chiefs moved on from surprise fantasy QB5 Alex Smith in favor of cannon-armed sophomore, Patrick Mahomes. This could signal an even greater commitment to a vertical passing game that made the Chiefs one of the most exciting offenses to watch in 2017. Sammy Watkins joins the fun in 2018 but could struggle once again to find significant target share in an attack already featuring top fantasy producers at each skill position. Best fantasy value: Kareem Hunt, RB — Hunt was PPR RB4 as a rookie and led the NFL in rushing yards despite inconsistent usage for a spell during the middle of the season. Andy Reid has hinted at a bigger receiving role for Hunt this season, yet his ADP remained a relative bargain at RB8. Fantasy bust: Sammy Watkins, WR — Reid’s average fantasy-points-per-game rank for his WR2 is 54.9 (stat courtesy of Scott Barrett). Watkins returning value at his ADP of WR33 seems almost impossible to envision without an extreme departure from 18 years’ worth of trends. Sleeper to watch: Spencer Ware, RB — There isn’t really a sleeper to watch in this offense who could find his way to relevance without injury to a starter, but the best candidate in that scenario is Ware. He amassed over 1,300 yards from scrimmage in 2016 and would have a RB2 floor if something happened to Hunt. 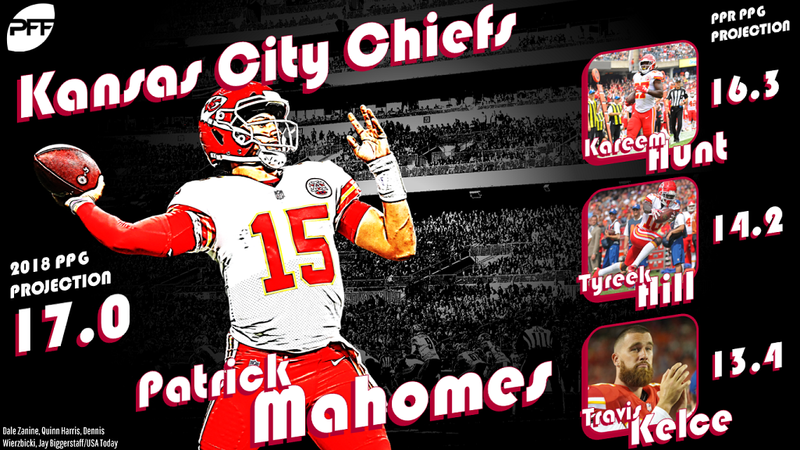 Best current player for their 2020 roster: Patrick Mahomes, QB — Though the team can boast Hunt, Travis Kelce, and Tyreek Hill, Mahomes has overall fantasy QB1 potential by the year 2020 thanks to his unmatched arm and rushing ability. It doesn’t hurt having all those weapons, either. Once again bitten by the injury bug, the team lost breakout spot tight end Hunter Henry to a knee injury before the hype could ever build. 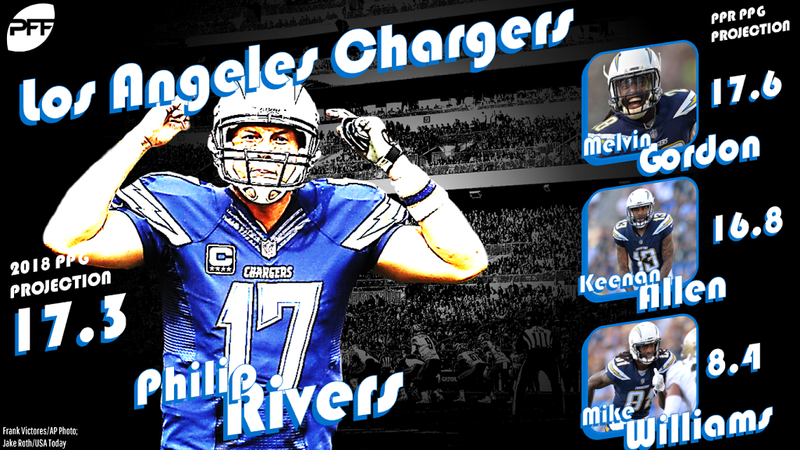 Philip Rivers will reprise his role as the underappreciated engine behind a number of fantasy producers as the team looks to deliver a playoff run in the waning years of his career. Best fantasy value: Philip Rivers, QB — The sheriff of the Chargers offense hasn’t finished worse than QB12 in the past five seasons and is coming off back-to-back top-eight fantasy campaigns. His ADP was QB14 this season. Fantasy bust: I don’t see a bust on the roster at ADP. Sleeper to watch: Tyrell Williams and Mike Williams, WR — This offense supported three top-42 wide receivers last season. With positional ADPs outside the top-50, both receivers could provide a return on investment, but if one of them becomes more of a featured contributor, then watch out. Best current player for their 2020 roster: Keenan Allen, WR — The 2017 Comeback Player of the Year posted almost 1,400 receiving yards and over 100 receptions. Just 26, he is just entering historical prime age for wide receivers and will still be in the window a few seasons from now. 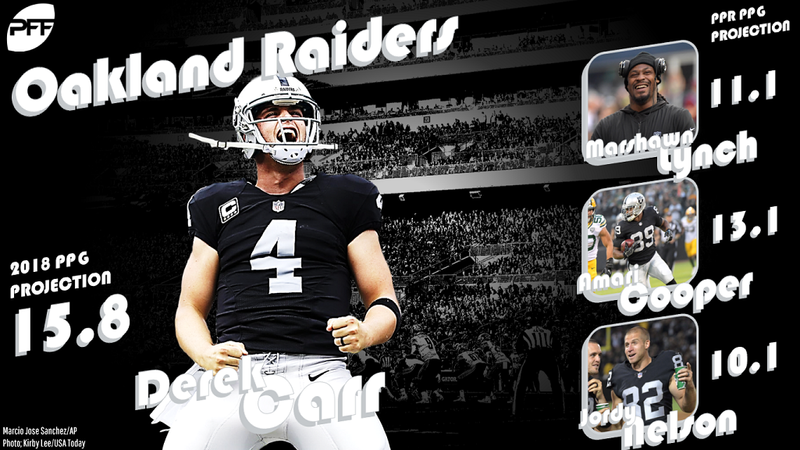 The Raiders feature the NFL’s oldest roster and it’s perhaps most apparent at fantasy-relevant positions. The team will feature something resembling a 2012 fantasy all-star team as it’s starting offense thanks for new head coach Jon Gruden’s love for veterans. Best fantasy value: Jared Cook, TE — The post-post-post-post-post-post-hype fantasy sleeper turned in a PPR TE12 performance in 2017 but drafters aren’t taking him until TE17 this year. Cook and Amari Cooper are the primary returning pass-catchers for Derek Carr in an offense that’s otherwise been overhauled. Fantasy bust: Despite my general skepticism regarding this team’s direction, the relevant fantasy players all have reasonable ADPs. Sleeper to watch: Jordy Nelson, WR — Nelson is just one season removed from a 1,257-receiving-yard campaign and was reportedly “moving like a 28-year-old” during camp (whatever that means). Gruden has a history of centering his offenses around veteran receivers which has actually yielded some surprising results – a 39-year-old Jerry Rice once had an 83/1139/9 line. Need a non-Hall-of-Famer reference? Keenan McCardell had a 84/1174/8 line as a 33-year-old in Gruden’s Tampa Bay days. Rookie(s) to know: Chris Warren, RB — The undrafted rookie free agent owned the 2018 preseason. Unfortunately, he suffered a knee injury that will cost him the season, but he could be an intriguing deep dynasty league stash if you can hide him on your taxi squad. Best current player for their 2020 roster: Amari Cooper, WR – he quietly battled injuries in 2017 and I expect a bounce-back year. Cooper’s 2,223 receiving yards through his first two seasons rank as the 10th-most to start a career since 1970. He’ll only be 26 in 2020 and will entering what should be the best years of his career.